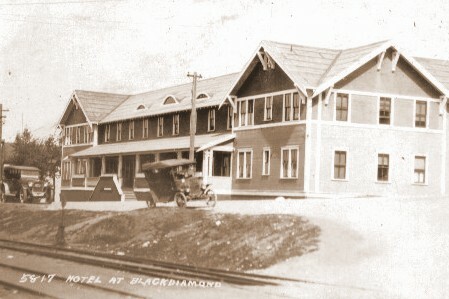 The 67-room Pacific Coast Co. Hotel was across the street from the depot/museum, where the Eagles are today. Harry Rossi was ten years old or thereabouts [ca. 1930], and it was his chore after school to pick up the trimmings from the Pacific Coast Hotel. It made good food for the hogs. He crossed the street at the depot with his load, down the wooden sidewalk going home. At the tavern, there were these three young men loafing out in front. One of them tripped Harry and his can of slop spilled all over the sidewalk. The young men roared with laughter and Harry scrambled to pick up the pieces. He hurried home, down the broad sidewalk, past the garage, past the dry goods store, the meat market, and the bakery, and down the hill to home. He felt so humiliated that he cried when he got home. His stepfather asked him what the problem was, but you can’t talk to dads about those things—they don’t like sissies. But you can talk to your mother and mothers do talk to their husbands. The next thing Harry knew, his father was marching up the hill with a 2×4 in his hand. Mr. Magnani stopped in front of the saloon and asked, “which one of you SOBs did that to my kid?” and they just looked dumb at each other, and didn’t even answer Mr. Magnini. The next afternoon it was even later than usual before Harry could muster up the courage to go after the hog feed. He crossed at the depot and approached the tavern very cautiously. But he kept his eyes straight ahead. The young men out in front never made a move nor said a word. Past the tavern Harry began to hurry with his load, past the shops and the bakery and down the road for home. On his face was a downright triumphant grin!